From the Publishers Weekly review: "Two experts from Yale tackle the business wake-up-call du jour-environmental responsibility-from every angle in this thorough, earnest guidebook: pragmatically, passionately, financially and historically. Though "no company the authors know of is on a truly long-term sustainable course," Esty and Winston label the forward-thinking, green-friendly (or at least green-acquainted) companies WaveMakers and set out to assess honestly their path toward environmental responsibility, and its impact on a company's bottom line, customers, suppliers and reputation. 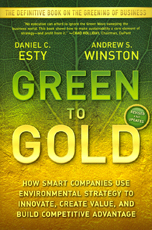 Following the evolution of business attitudes toward environmental concerns, Esty and Winston offer a series of fascinating plays by corporations such as Wal-Mart, GE and Chiquita (Banana), the bad guys who made good, and the good guys-watchdogs and industry associations, mostly-working behind the scenes."